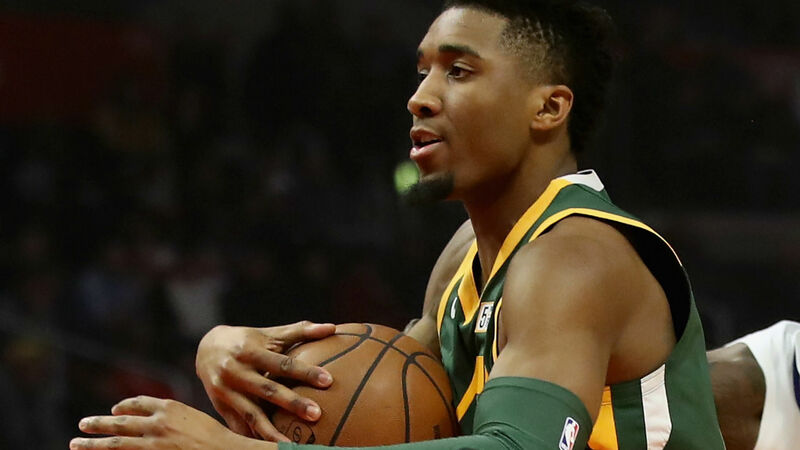 Donovan Mitchell scored a game-high 34 points Thursday, but he couldn’t knock down the shot the Jazz needed most. In the final moments versus the Hawks, Mitchell missed a 22-foot 3-point shot that would have tied the game with 1.8 seconds left. Instead, Atlanta spoiled Utah’s five-game win streak with a 117-114 win. Mitchell finished shooting 15 of 32 from the field and 2 of 6 from 3-point range. All of the Jazz’s starters were in double figures with Ricky Rubio (17 points) trailing Mitchell. The Jazz held an eight-point lead more than halfway through the quarter after this dish from Rubio, but couldn’t hold on to their advantage. But after the back-to-back buckets from Rubio and the ensuing assist, it was the Hawks’ turn to get hot. Trae Young led Atlanta’s efforts with 23 points. He went 8-for-22 shooting from the field and 1-for-6 from long distance. Young tallied a double-double after also finishing with 11 assists. The Wizards were dinged with a loss against the Nuggets, but Bradley Beal finished with a game-high 25 points in Washington’s efforts. On Denver’s side, five players led with 15 points each. The Mavericks didn’t get much help from their big man including Maximilian Kleber, who tallied just five points. Dallas traveled to Sacramento to face the Kings and lost, 116-100. Kleber finished minus-21 on the night. Here’s another one: Early in the Suns-Pistons contest, Mikal Bridges found Deandre Ayton, who slammed it down for the finish. Thunder (42-30) at Raptors (51-21), 7:30 p.m. ET (NBATV) — Oklahoma City is holding on to its eighth seed with a comfortable gap between the Western Conference teams that are still trying to revive their seasons. But the Thunder have lost their stride as of late and will take a four-game losing skid to Toronto when they face the Raptors on Friday. The No. 2 team in the East has put together back-to-back wins, but will be without All-Star guard Kyle Lowry, who will miss his second consecutive game with a sprained right ankle.